How Easy is it to Use Cedar Planks for Grilling Fish? 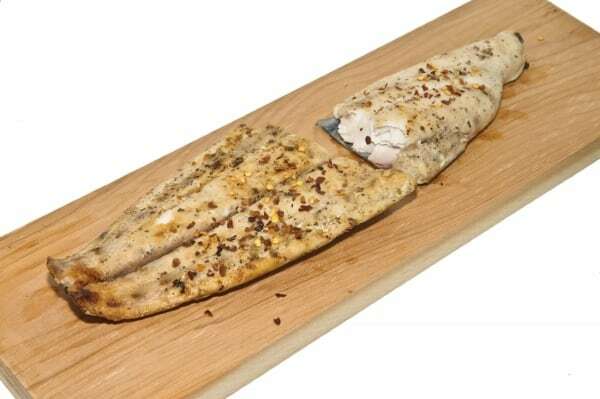 Using cedar planks for grilling fish is a very easy way to cook a delicious meal for your family. Because fish falls apart easily as it cooks, a cedar plank is the best way to grill your favorite type of fish. The planks are simple to use and there are an unlimited amount of recipes you can try until you find the one your family loves the most. All cedar planks need to be soaked overnight, or for at least several hours, before they can be used. This prevents the boards from catching on fire in your grill. If you have a sink that is big enough, the planks can be soaked there. Be sure that the entire plank is under water. You may have to place weights on the planks to keep them submerged. You can also soak the planks in a five gallon bucket with a lid. Although you can soak the planks in plain water, once you are more comfortable with using them, you can choose to add herbs, juice, or even wine to the water. Any of these will give your fish a different flavor and it can be a lot of fun experimenting with different flavors to see what tastes the best. You will need to be sure your grill is completely preheated before placing the planks inside. Do not put your fish on the planks until they have warmed up, too. You will know when they are ready as they will begin to smolder. Place your piece of fish on the cedar plank when they are ready. Add any fruits or vegetables that you will to cook with your fish. Citrus fruits give fish a delicious taste and can be easily sliced and placed on top of your fish as it cooks. Close the grill cover and only check on your fish every 5 or 6 minutes. You will know the fish is cooked all the way through when you can easily flake the fish apart with a fork. For most pieces of fish, it takes about 20 minutes to thoroughly cook. Do not open the lid repeatedly as this will allow heat to escape and it will take longer for your fish to cook. Many common recipes call for you to marinate your fish before grilling it on the cedar planks. This is a simple way to add a special taste to your fish. The internet has many options for different marinades you can easily make or you can create your own from your favorite herbs and oils. Make sure to marinate your fish for at least 15 minutes (but it is better to let it sit up to an hour) before putting it on the grill. The best part of using cedar planks for grilling fish is the fun you will have discovering new flavors to use on your fish. Let your imagination flow and see what combinations are the most delicious. Cedar planks for grilling fish is fun and the cleanup is easy!